It’s a dream come true – a virtual showcase of hundreds of dresses by Valentino. Due to go live on December 5th, the Valentino Garavani Virtual Museum will give the world access to the designer’s archives covering his fifty years in the business. The site will feature three-dimensional technology providing an up-close experience. Each piece revolves and many will include photos, video and audio commentary. Also included in the virtual museum will be sketches, illustrations, ad campaigns and more. Download the desktop application and then it’s all at our fingertips, available anytime, and we can linger as long as we like. Click here to see a video teaser and register for updates. 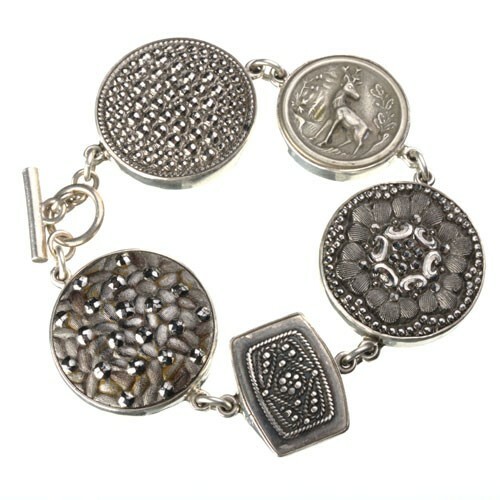 Antique buttons set in sterling silver designed by The Buttonist Sarah Durling. I had the best time chatting with Sarah Durling, a Berkeley native, antique button collector, and designer of jewelry made with buttons. Plus, she now lives in England … oh my gosh, all my favorite things. We met at Nabolom Bakery in Berkeley on a chilly autumn day. Over hot tea Sarah told me all about her button collecting and jewelry making. 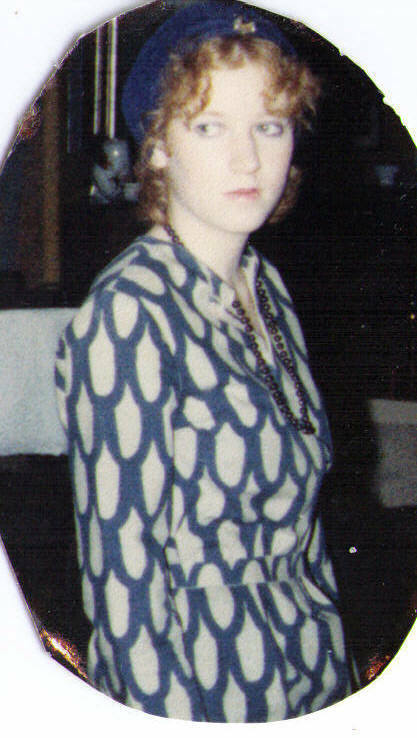 Step into Mom’s Closet and hear what Mom has to say about her Marimekko dress. 1960s sequin pantsuit with fur cape. Love the butterscotch Lucite handbag and polka dot headscarf. My mother and I had a great time at the Vintage Fashion Show and Tea on Saturday, November 12th. 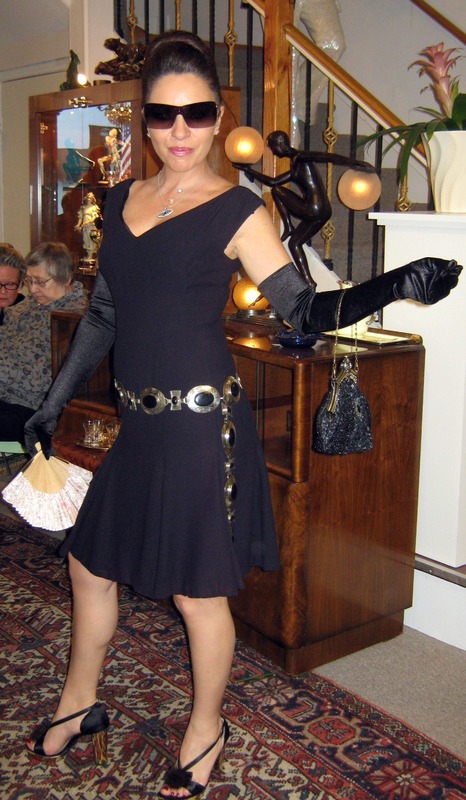 A fundraiser for the Friends of the Lafayette Library, the show was held at Collector’s Choice Antiques in downtown Lafayette and featured vintage fashions from the store’s collection. As a fashion writer I have attended many fashion shows and I have to say catwalks are not my cup of tea. I prefer the old-school style with models strolling out into the crowd, allowing for a slower pace and a closer look at the clothes. So, I was thrilled to find someone agrees with me. JB Kaye, who styled the show, had the models descend the store’s staircase one at a time and circulate among us. With ten models in all, there was a constant stream of vintage outfits to admire. Holly Golightly ... where have you been? Fashions highlighted were from the 30s to the early 90s and included knit suits, daydresses, evening gowns, and lots of fabulous accessories, particularly Bakelite. Rather than keeping it era specific, JB, who also works in the shop and is an avid vintage collector herself, mixed it up combining pieces from different periods creating unique ensembles suitable for any modern woman. As I watched the models, looking oh-so-chic, it occurred to me that women back in the day dressed like this all the time. Even a non-fashionista always left the house put together, complete with hat and gloves. Today such attire is either only for dress-up or a costume. I’m hoping more shows like this will inspire women to put a bit more effort into their daily look. Most of what was shown was for sale at reasonable prices ($90 to $150) and a lot was snapped up by eager collectors. But not for sale was a simple cap covered in crystal-like drops (pictured right). Originally worn by Elizabeth Taylor, this stunning piece is part of JB’s private collection. The afternoon flew by (a full two-hour show) as we enjoyed tea sandwiches on vintage plates, sipped wine served in goblets, and tea served in china cups. There wasn’t a paper plate or plastic cup to be found – now that’s doing it in style. Besides viewing all the clothes, the most fun was talking vintage with liked-minded people. Congratulations to Collector’s Choice Antiques and Friends of the Lafayette Library on a fashion show well done. 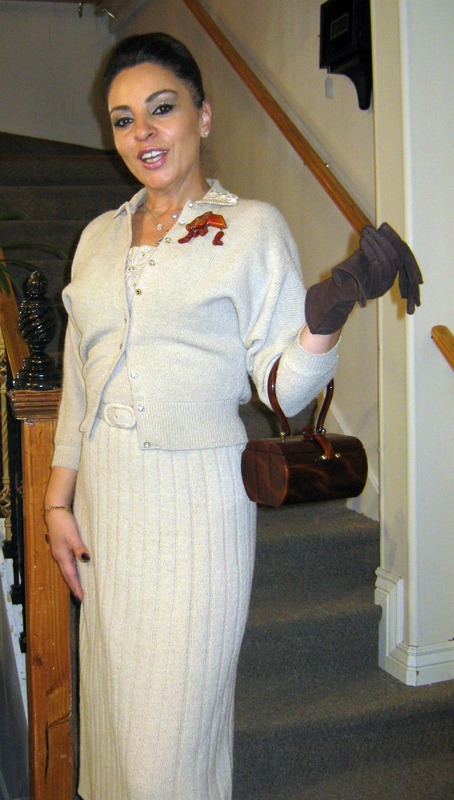 PS – Rumor has it that the shop’s owners, Carl Himmelman and Kathy Himmelman are planning a spring 2012 vintage fashion show. Stayed tuned to Over Dressed for Life for details. I’m wearing Corduroy today are you? I’ve always been a fan of the soft, textured fabric and so evidently are a lot of other people. 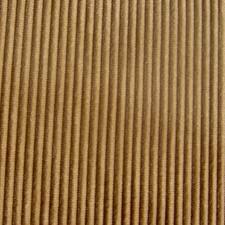 The Corduroy Appreciation Club is having their Grandest Meeting today, 11/11/11 in honor of the day that most resembles Corduroy (fans capitalize). I think I’m going to have to join this club. Custom-made coat by Theresa LaQuey. 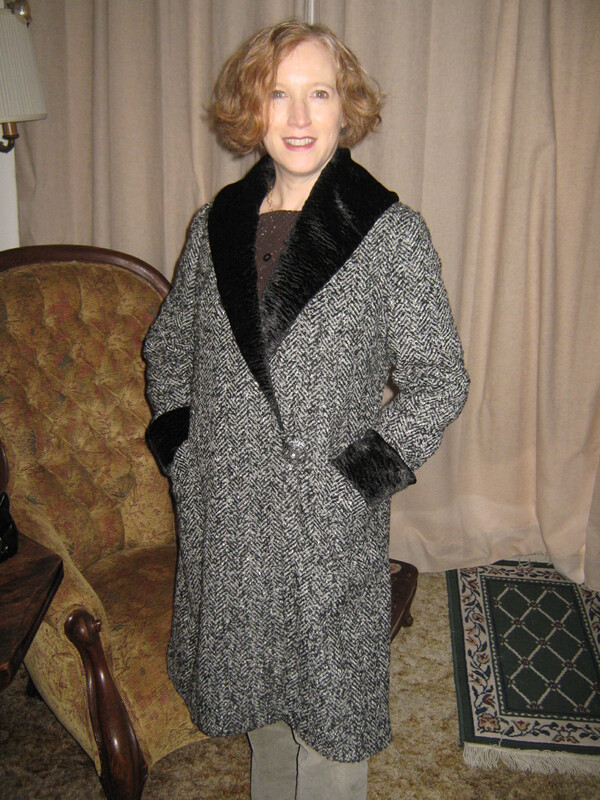 Ta da … finally I present my fabulous custom-made 1920s inspired coat, constructed and sewn by Oakland designer Theresa LaQuey. This project started last Christmas when my mother suggested that I have a coat made and use for the trim my vintage stole made of faux broadtail. Stiff and awkward, I had never used the stole. So I figured what a great new life for a beautiful piece of faux fur. I knew I wanted a 1920s silhouette and looked at period costume books by John Peacock. I met with Theresa in January and as she specializes in vintage clothing design, she understood what I was going for. The whole project took six months but well worth the wait. Finding the right fabric was a slow process and I made several trips to Stonemountain and Daughter in Berkeley while Theresa first constructed the coat in muslin. Eventually, I found this lovely wool tweed made in Italy. The black and grey fabric brings out the subtle texture in the broadtail. Lining fabric in a silk blend. 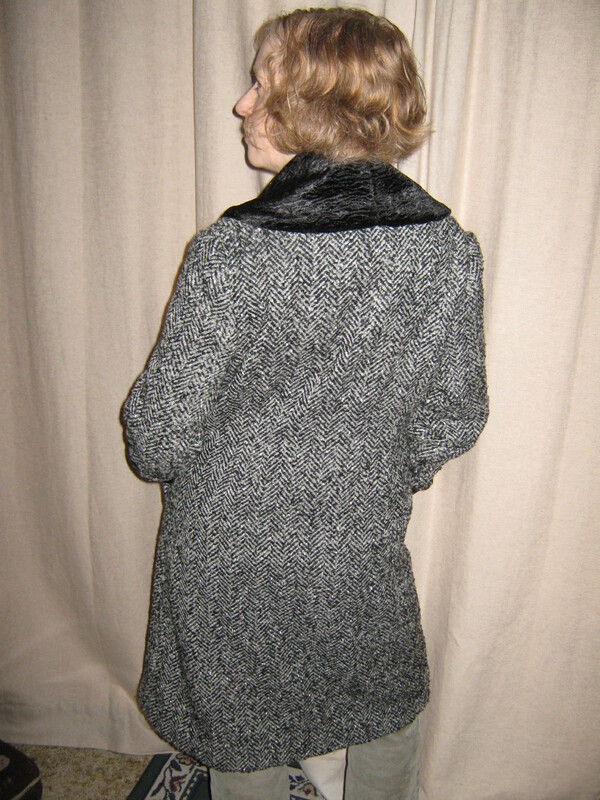 The coat lining was even more tricky, as I wanted something kind of showy but nothing that would clash with the tweed. 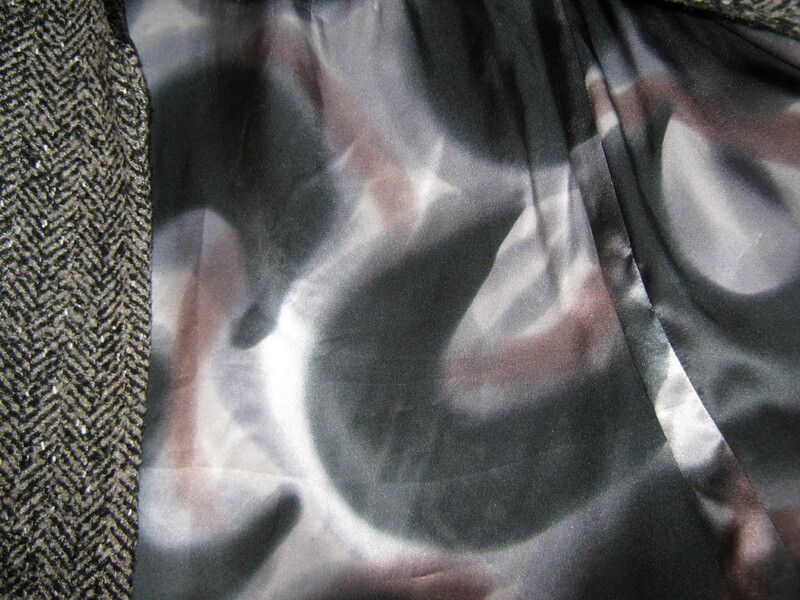 Again I headed to Stonemountain and Daughter and found this crescent moon print in a silk blend. Given that the crescent is a favorite motif of mine, I was over the moon (so to speak). The coat has a one button closure for which I chose a carved glass button from Czechoslovakia. I couldn’t be happier. My coat fits like a glove and is both elegant and practical. I particularly like the sharp line of the trim at the neck, which highlights my stacked bob and makes me feel tres chic. Initially for something different, we considered putting the broadtail just below the elbow rather than at the cuff but I concluded that look would work better on a taller woman. What I love most about this coat is there isn’t another one like it. It is unique, beautifully made and no brand designer can top it. Now that the autumn chill has arrived, my new acquisition will not remain in the closet waiting for special occasions – it’s going to hit the town.